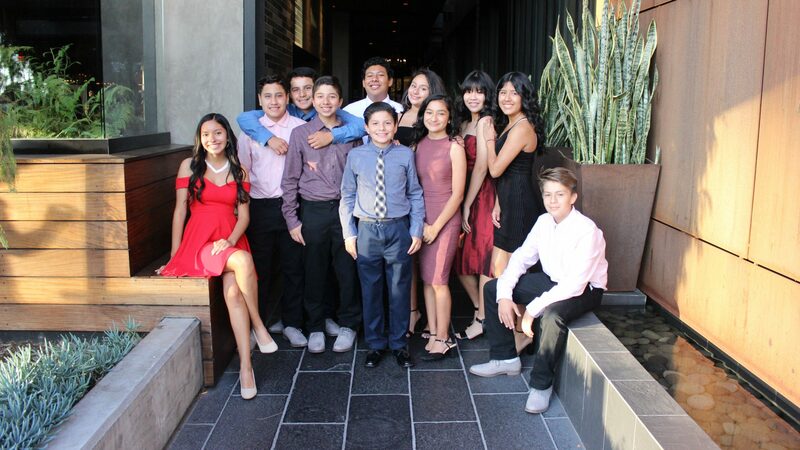 Please consider giving to Boys Hope Girls Hope through your will, trust, retirement plans, or life insurance policy. This is an effective way to both positively impact future generations of children and to assist in lowering or eliminating the estate tax burden on your heirs. You can give cash, personal property, securities, real estate, insurance and retirement plans. When you make a direct gift today, you benefit immediately from this addition to BHGH’s assets. A gift pledged today will benefit BHGH at some future time while allowing you to give much more than you otherwise might. A deferred gift may also offer you immediate tax savings and lifetime income. When you make a gift without restrictions, BHGH has the flexibility to use your contribution for the most pressing needs at the time. If you have a special interest it may be possible for you to designate a gift specifically for that purpose. The BHGH staff can provide you with a list of programs approved for designated giving. A bequest is a gift passed down through a will or living trust. It entitles you to an estate tax deduction equal to the amount of the gift, thus reducing your taxable estate and federal tax liability. You create such a trust by transferring cash, securities or property to a trustee of your choosing. Thereafter, for life or a predetermined length of time, the trustee will provide income either to you or your beneficiary at least once a year. When the trust expires, usually at the end of your life, or your beneficiary’s life, the principal passes to BHGH. A life income trust is an excellent choice for highly appreciated assets that provide little or no income. There are two types of life income trusts, an Annuity Trust and a Unitrust. Annuity Trust (Fixed Income) – With this type of income trust, you receive the same dollar amount every year, determined at the outset by your individual needs. An annuity is the best choice for highly appreciated assets that produce little income. Unitrust (Variable Income) – This is the more flexible of the two types of life income trusts. A unitrust pays you a predetermined rate of return, according to the value of the trust assets each year. Since the value is recalculated each year, your income may vary. You may add to the principal of a unitrust at any time unlike the annuity trust. The charitable gift annuity is a legal contract under which the Orange County Community Foundation agrees to pay you a fixed dollar amount for your lifetime in return for an irrevocable gift of cash or securities. BHGH is able to offer a “guaranteed” life income because this obligation is secured by the Orange County Community Foundation assets. The assets placed in a charitable lead trust generate income now for BHGH for a designated lifetime or term of years. For transfer-tax purposes and when the trust terminates for the benefit of the his/her family, subsequent appreciation transfers without tax. This is for a Gift or Estate Tax Deduction. The donor transfers cash to a Grantor CLT. The value of the payments to charity are front loaded in the first year to give a substantial INCOME tax deduction. At the end of the term the trust comes back to the donor. The donor lets the charity “rent their money” for a term of years. 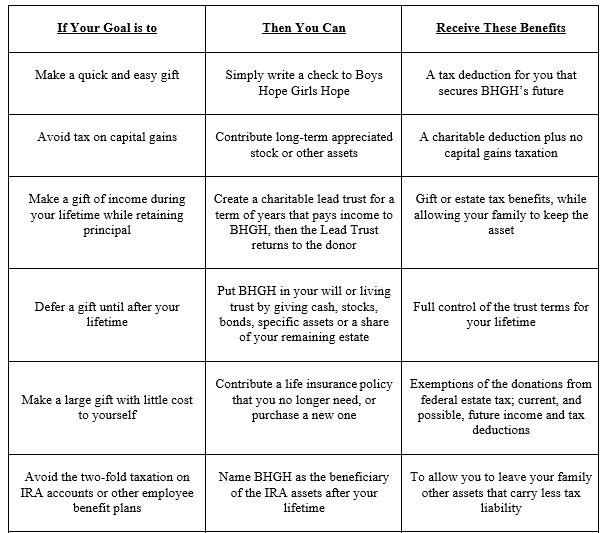 By naming BHGH as a beneficiary, retirement plan assets will escape income tax and will avoid estate tax on estates fully subject to the estate tax. During lifetime, the owner of the retirement plans can continue to take withdrawals and be free to change the beneficiary if circumstances warrant. You may assign ownership of a life insurance policy to BHGH or irrevocably name BHGH as beneficiary. The nature of the policy will determine the amount, if any, of your tax deduction. One can gift their home or vacation home to BHGH and continue to use it for their lifetime. BHGH will own the home, but the donor will still be responsible for maintenance, taxes and insurance. One receives an immediate income tax deduction based on the fair market value less the present value of the life tenancy. A donor can sell their residence or other property to BHGH at less than its fair market value receiving cash in turn and a charitable income tax deduction for the discount taken from fair market value. The cash can be used to purchase another home or facilitate the entry fee to a retirement community.